CHICAGO – The Association for Library Collections & Technical Services’ (ALCTS) Preservation and Reformatting Section Committee for the Hollinger Metal Edge sponsored George Cunha and Susan Swartzburg Preservation Award has selected Thomas F. R. Clareson as the 2014 recipient. The award will be presented on Saturday, June 28, at the ALCTS Awards Ceremony during the 2014 American Library Association (ALA) Annual Conference in Las Vegas, Nevada. Mr. Clareson has served as the LYRASIS Senior Consultant for Digital & Preservation Services since 2009. Previous to his time at LYRASIS, he was the Program Director for New Initiatives for PALINET, and the Imaging and Preservation Services Manager for Amigos Library Services. In addition to his work as a preservation consultant, he has taught preservation courses at the University of Texas, University of California Los Angeles, and Kent State University graduate Library school programs as well as countless continuing education courses on preservation topics through Amigos, OCLC, PALINET, LYRASIS, the American Library Association, SAA, and AASLH. As a leader in the field of preservation, Mr. Clareson has served as an advocate for collaborative preservation through nationally renowned efforts. These efforts include working with the Heritage Preservation Alliance for Response Program where he was a crucial advocate since its inception in 2003; the Institute for Museums and Libraries Connecting to Collections Program in which he worked on 17 planning grants and six statewide implementation grants all created for the purposes of collaborative preservation; the California Preservation Program (CPP) in which he served as the lead facilitator and organizer during the development stages. Mr. Clareson is also seen as a “cross pollinator” where he brings institutions and organizations together to share experiences and knowledge. In addition, Mr. Clareson has been an active member of PARS for a number of years and has served as chair of various committees, taskforces, and elected positions. Established in 2007, the award honors the memory of George Cunha and Susan Swartzburg, early leaders in cooperative preservation programming and strong advocates for collaboration in the field of preservation. The award acknowledges and supports cooperative preservation projects and/or rewards individuals or groups that foster collaboration for preservation goals. 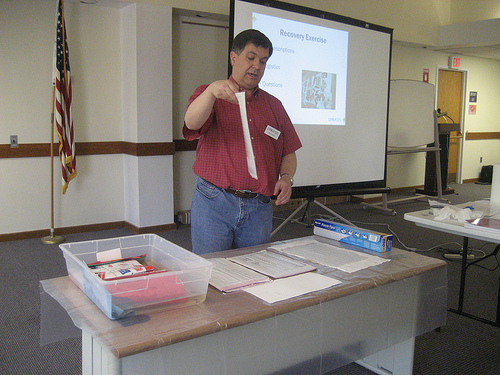 Demonstrating disaster recovery techniques at the New Jersey State Archives. December 1st is the deadline for nominating or applying to several ALA-ALCTS Awards. If you are nominating someone or applying yourself, be sure to get your documents into the committee chairs ASAP! You can find more awards at the ALCTS main awards page, the following are more preservation-related. “Jan Merrill-Oldham has actively worked in the area of preservation since 1975, achieving both a national and international reputation in her field. Until September 2010, Ms. Merrill-Oldham served as the Malloy-Rabinowitz Preservation Librarian at Harvard University Library, directing the Weismann Preservation Center at Harvard University and the Preservation and Imaging Services Department at Harvard College. She has participated actively in ALCTS since 1980 with committee appointments ranging from the Legislation Committee, Nominating Committee, and Membership Committee to the ALCTS Board of Directors and the Preservation Microfilming Committee. Merrill-Oldham has also served in PARS from 1980, where she developed a well-earned reputation as one of the preservation community’s foremost leaders. Her involvement in PARS includes having served as vice-chair/chair of the Section, chair of the PARS Nominating Committee, chair of the Task Force on Preservation Digitizing, chair of the Task Force to Initiate Further Action on Alkaline Paper Legislation, co-chair of the Photographic and Recording Media Committee, and member of numerous other PARS committees. Merrill-Oldham has made extensive and substantive contributions to the literature of preservation, including four books “Preservation Program Models: A Study Project and Report,” “Guide to the ANSI/NISO/LIB Library Binding Standard,” “Guide to the Library Binding Institute Standard for Library Binding,” “Conservation and Preservation of Library Materials,” chapters in numerous other books on preservation, conference proceedings, and articles in domestic and international journals. Her presentations on preservation at conferences, meetings, and workshops read like a travelogue ranging from Boston, Chicago, and San Francisco to Quebec, Ontario, The Hague, Stockholm, and Uppsala. She is a recipient of two major ALCTS awards, the 1990 Esther J. Piercy Award and the 2004 Paul Banks and Carolyn Harris Preservation Award. The award will be presented at ALA Annual’s awards banquet on June 28, 2011 in New Orleans. The PCAN editors would like to congratulate Jan for her lifetime of work and dedication to the field. She has been a mentor, teacher and supporter of young preservation professionals for a very long time and has contributed to the success of so many of us in the field today. Hip Hip Hurrah!